Proud holders of the Royal Warrant and supplier to many of the world's finest hotels and restaurants, supermarkets, delis and food halls, John Ross Jr has carved a global reputation for producing world-class smoked salmon. Traditional red brick kilns dating back to 1857 and a passion for creating premium quality smoked salmon products using time-honoured techniques is at the heart of the smokehouse, which sits on the edge of Aberdeen Harbour. Its historic kilns, which have been listed by Historic Scotland for their cultural significance, have survived throughout the 20th century and now take pride of place at the centre of the smokehouse. They are used daily to smoke the highest quality salmon from the North West waters of Scotland and create what many world-class chefs claim to be the best smoked salmon in the world. 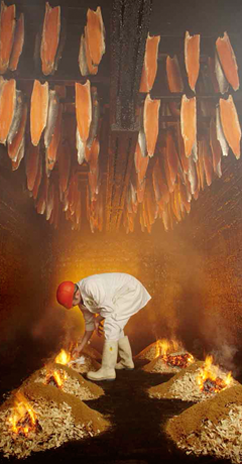 Having been producing superior Scottish smoked salmon in the truly traditional way for over 150 years, John Ross Jr is now one of the last remaining smokehouses to create smoked salmon the way that it used to taste; rich in texture and succulent in taste. For those looking for a taste of tradition, then please continue to shop and place your order online. For wholesale and trade enquiries please call 01483 224900.